Since 1986, Russell has been practicing law in California. He is a board certified worker’s compensation specialist and is an AV rated lawyer by Martindale-Hubbell, the highest rating used by this esteemed peer review legal publication that evaluates attorneys across the nation. For more than a decade, Russell has been identified as a leader in the worker’s compensation field for Southern California by peer review publications Super Lawyers and Top Attorneys of Southern California. Russell is a recognized leader in the worker’s compensation legal community, making numerous presentations at state conventions and local seminars to worker’s compensation attorneys. He has qualified and testified as an expert in worker’s compensation law in Superior Court and has been a professor of worker’s compensation law at Santa Barbara Colleges of Law. 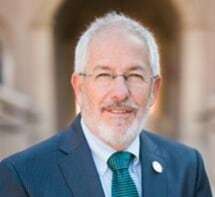 He has appeared and argued before the Courts of Appeal and California Supreme Court many times, pushing the boundaries and extending the law to protect the injured. He is a sustaining member of the California Applicant’s Attorney’s Association, the Santa Barbara County Bar Association, the American Bar Association and a member of the United States Supreme Court, Ninth District of the US Courts of Appeal and Central US District Court. Russell represents injured workers before the Worker’s Compensation Appeals Board; various disability retirement boards, including SBCERS, VCERA, KCERA, TCERA, and CalPERS; and personal injury claims in Superior Court. He was privileged to work with his father, Allan S. Ghitterman, for more than two decades. They laughed, argued, and ate lunch together for many years. His father was his mentor and hero.